Talk about performance! This member of Logan's mat cutter family has it all. From its anodized aluminum base on up, this cutter is solid and dependable. Features of the Model 850 include a super-smooth gliding action on the cutting head, a quick-change magnetic blade cartridge, a micro-adjustable moving magnetic stop, and an extended squaring arm that detaches easily. The Model 850's extra-long cutting bar is designed to easily accommodate and cut full-size sheets of 8-ply and 4-ply matboard up to 40" long. Comes with 5 extra #267 blades. Blade #267 — For use with Logan's Platinum Edge Mat Cutters and Total Trimmer T300. The Logan 850 Premium Edge Mat Cutter is full of great features - this video will demonstrate them. 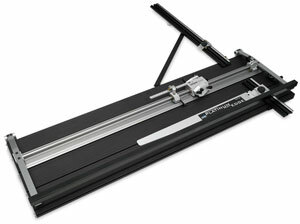 See how to cut a mat on the Logan 850 Platinum Edge Mat Cutter. To see all of the features of this mat cutter, be sure to watch Logan Platinum Edge Mat Cutter Features video.